Discover for yourself what Herb Caen referred to as "the best kept secret in the Bay Area." Tucked away on the side of Mount Tamalpais overlooking Muir Woods is a jewel that somehow eludes notice from locals, yet draws travelers from all over the world. Internationally-recognized arts center housed in a century-old former military barracks. Law-protected wreckage serves as a peculiar memorial for an almost forgotten World War II tragedy. One man's love of natural beauty led to the creation of this hidden granite monument. The winding roads to the parking lot, and then the 1/4 mile hike along twisty mountain trails from it set the mood for what lies ahead: a wooden Bavarian lodge with a view to die for, which just so happens to also offer a selection of tasty adult beverages. Eponymously called the “Tourist Club” or “German Tourist Club” is the San Francisco chapter house of Nature Friends International. NFI is a worldwide organization dedicated to environmentally conscious tourism, protection of natural and cultural heritage, and climate protection. As such, they have chapters in dozens of countries with over one thousand houses. Most of these chapter houses are in German-speaking countries in Europe, but there are many overseas as well. The main purposes of these houses are for facilitating outdoor excursions, hosting Alpine cultural events, and acting as a hostel for members. The beer is ancillary to the primary purposes, but is also quite tasty. Membership in the international club grants reciprocal benefits with other chapter houses. The location of chapter houses is designed around the natural beauty of the surrounding landscape, which is itself an enticing reason to join. 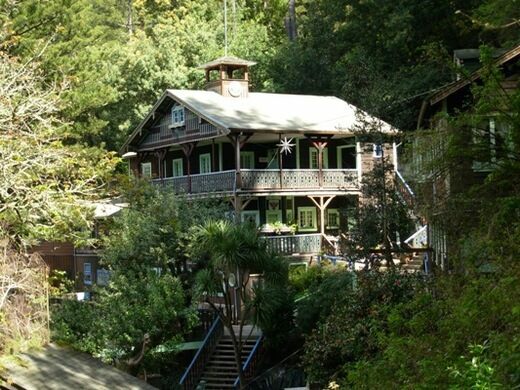 This Nature Friends house in Mill Valley was built in 1914, and was the first foray of the organization in the United States. Two more California chapters shortly followed suit; one across the bay in Oakland (1921) and another in Southern California in Sierra Madre (1920). Beyond being open for visitors on selected weekends, the Mill Valley location also hosts seasonal festivals like Maifest, Sommerfest, and Kinderfest; stocked with beer, sausages, dancing and live music. These festivals are a lot of fun and are very popular with those that know about them. Bring cash, get there early and expect a crowd. The Tourist Club is first and foremost a private organization, but they do open their doors to the public on selected times. Please research the public hours before arriving. Pack a lunch with a large water bottle, and lace up your hiking boots nice and tight. A living time capsule of the 1960s Richardson Bay water-front. A working model of the entire San Francisco Bay and much of the Sacramento River Delta, complete with regular tides that change every 14 minutes. The sprawling, eccentric estate of Ames and Ames, a brilliant botanist, and a genius inventor and artist.